September | 2013 | Whose Education Is It Anyway? A new academic year and renewed, but no doubt short lived, interest in the media for (higher) education. The BBC’s On The Money advocated the continued value of a degree in face of renewed interest in apprenticeships and ongoing tuition fee burdens. Meanwhile The Guardian ran a story on the negative impacts of the rises in degree seeking students numbers, the comments including some ‘interesting’, but valid, ones on how industry, economic and education policy still do not seem to be aligned. Personally I always like to think of education in the terms of Stephen Fry’s memoirs – “a university is not, thank heavens, a place for vocational instruction, it has nothing to do with training for a working life and career, it is a place for education, something quite different. A real education takes place, not in the lecture hall or library, but in the rooms of friends”. I perhaps exaggerate my support for what he calls a “loose learning” experience, especially of the late ‘70s Cambridge kind, but in hindsight his experience was similar to mine, I transformed between 18 and 21. Although I acknowledge there are other ways to do it, I do not think going into the management training scheme I was offered at 18 would have led to me becoming as ‘rounded’ a person as I am now, albeit one still in debt to the Student Loan Company decades on. On The Money’s host and panel still found, in 2013, that they could make jokey remarks about getting up late, staying up late and enjoying ‘dating’ whilst a student. We seem to have created a perverse situation where we tell students they should be enjoying themselves but effectively force them into a world of debt worries and part time work. I could only complete my BA through parental support (ably assisted by the cheapest rents of any UK university city), the fact tuition fees were much less then than now and when it came to my MA I worked 9am-10pm for a fair percentage of the time (university in the day and shop work in the evenings – with an hour or so commute at the end of the day). It is this postgraduate spell which creates my empathy for today’s undergraduates, I did not enjoy myself in the way I did as an undergraduate and I did not take away a full ‘education’, it was very much about passing the vocationally-focused course. The growth in student numbers, highlighted by The Guardian, has created the situation that degrees are, as it describes, used as a differentiator for any kind of job description (when I’ve advertised for jobs the logic has been that a graduate should guarantee a certain grasp of English that a school level qualification would not) and we are really now talking about postgraduate qualifications as the way into a particular workplace. In this regard Mr Fry is perhaps correct that undergraduates would be better looking for liberal arts grounding but the postgraduate costs are such that people are jumping in to a profession centric undergraduate degree, limiting their options afterward. The realities of today’s job market versus the need to educate people to be flexible in tomorrow’s are the great challenge created by tuition fees in my opinion, people simply cannot afford to reskill in the way the country should need them to. There has been much in the press about a lack of anti-cyber crime skills, presumably there are un(der)employed computer science graduates who would love the option to study that area to a higher level but simply would not be able to afford the fees (presuming training providers can get the course out in the first place). This all said, there seems to be less bad news in the press about the economic malaise facing education than last year, perhaps as the HE funding landscape has had a year to readjust. However, a warning of the long feared ‘education bubble’ has come from the bankruptcy of Cengage (excellently covered in this article). Whilst it is easy to consider that OER, MOOCs and the resources available on the Open Web have crippled Cengage it is a clear warning to those expecting guaranteed results from investment in education. Indeed it is perhaps a warning against specialist organisations, in publishing or anything else, going it alone rather than having a larger body to absorb losses. YouTube, for example, is infamously expensive to run but via its own marketing and Google’s muscle can continue. Cengage seems to have left itself open to collapse unlike education publishing within bigger organisations such as McGraw-Hill or Pearson. Perhaps the publishers saw the collapse coming but it is noticeable that, after years of complaining at publishers holding onto materials and charging too much, that there is now the risk that really high quality products are lost to the world’s educators and students. It is simply not the case to say the web will serve everything you would need to educate, self publishing may be a solution but the potential volume of digitisation and the scope for innovative design means that there will surely be a room for the for-profit sector. Indeed their real value may be in capturing subject expertise from industry, such as cyber detection, for students where the professional does not perceive a career in academia as the correct one for themselves. Whilst JISC and others have worked with partners in digitisation and other areas I would see this as a key area for academic publishers to improve upon, they seem the natural conduit for bringing business and academia better aligned and they might just make some money in the process. Today might end up being a truly historic one that we look back to…or it might not. Either way, FutureLearn caused a stir when it was announced and has created some patriotic drum beating today, the UK entering the online-HE-space ‘race’ (some would say to the bottom), perhaps not coincidentally timed a year from the Scottish referendum vote and largely ignoring the Australian component. FutureLearn can be seen as a first step, a way to help those considering putting their bum in an actual University seat as well as, you would imagine, something that will develop into a full blown credit bearing beast at some point. After all, Coursera’s business model was questioned but is increasingly being seen as feasible with the limited purchasing of credit bearing certificates combined with potential sale of courseware. – One being run on a Moodle installation, which I’m largely ignoring as I’m picking up the videos on YouTube and that’s about all I have time for. – One being run on CourseSites, which I’m largely ignoring but is interesting in that the tutor has agreed licences with Pearson for value added materials you would not normally have open access to. My point being, will the FutureLearn ‘courses’ delivered be much more than a mix of media that can be accessed elsewhere? The instructional glue and communication elements are therefore essential. Unlike Blackboard users transferring courses to run as MOOCs on Coursesites, by being on its own system it at least suggests that some thought will go into ‘MOOCing’ the content. The real annoyance for many who have worked in Learning Technology is the sale in the media of MOOCs as something new. Yes, the scale goes beyond what has been done before but otherwise these are not so revolutionary. The networked learning that may have been attached to some of the truly open courses at the movements beginning is fast becoming mainstream, even in corporate environments. Indeed it is noticeable the focus give to FutureLearn’s mobile compatibility in the initial press reports, i.e. this is about learning when and where you want to not necessarily how you might best learn. In addition the MOOC detractors are picking up on issues such as how to avoid cheating in MOOCs, something which has been worked on in the online sphere both by learning and technical focused staff for some time. There are solutions here but of course it comes back to the quality of the learning design. What seems to be missing in many of the MOOCs I have attended is that if you really need more dialogue than a university length course can afford, should these experts rather not engage people in an ongoing community where people can continue to learn over time, influence by the latest research and not with a solitary ‘tutor’ voice? What I would really love to see is a community of interest introduced via a MOOC, rather than universities trying to advertise their expensive offerings. There is a good summary here that considers the importance of brand in all this and again the two MOOCs I mention above fail. Emails the tutor sends me from Blackboard or Moodle are largely plain text, no branding, no really obvious sign where or who they have come from. I am presuming this will be different in the three FutureLearn courses I have signed up for. Indeed it would seem FutureLearn are ‘going alone’ in the technical regard with a recent job advert (for a Learning Technologist) on LinkedIn combining an interest in online education with substantial technical skills in analytics, programming (including Ruby on Rails) and writing to “top ranking journals” quality. The boldness of the approach, not least from the technical side is further covered here. I think mapping/quadrant approaches are a useful one for the debate and, as Elearnity pointed out, helps direct procurement decisions rather than directly making any. Of course, as always, context is the key piece which such generic guides cannot cover. Whilst this guide is more UK/EMA friendly than the often US-dominated landscape there still lacks a certain amount of objectivity here. For example, an LMS to launch bits of learning is very different to one which houses full curricula and the associated social tools. However, it’s perfectly justifiable for an organization to want different things depending on what else they have in place to support users in terms of HR systems, portals, etc. etc. It is also difficult to fully support the idea that big corporate vendors necessarily hold potential/performance than open source solutions. For example Moodle’s extensive plugin library means you can add in support, for example, for Tin Can or you can choose not to. Here context comes in again, in that a corporate customer may prefer a corporate relationship whereas many Higher Education LMS users prefer an Open Source mentality. So how might you bracket Learning Management Systems? Well, here’s a very basic mockup of an alternative from me with ‘Potential’ (which would partly be based on track record but also future gazing where, for example, there is a big VC financial backing) vs. a ‘Course > Collaboration’ judgment on the basis of a system’s cope from launching SCORM and resources as opposed to something which could actually act as your social enterprise hub. I would argue this offers a different paradigm to ‘performance’ which would help identify what type of system you are looking at. 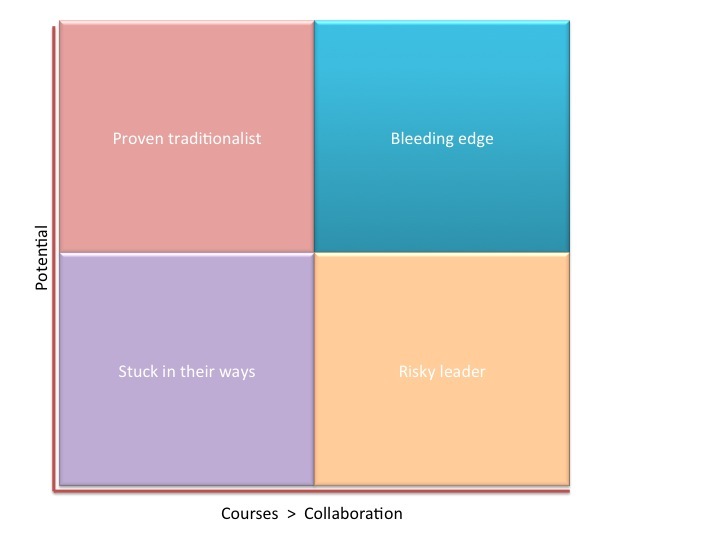 Acting as such a hub might not be that ‘bleeding edge’ for many orgs but I still like to think that most people would, ideally, be looking to push the barriers of what’s possible so that’s a reasonable title to assign to it. It might just be that their ‘bleeding edge’ learning tech is scaled back by what is already in place internally as appropriate.